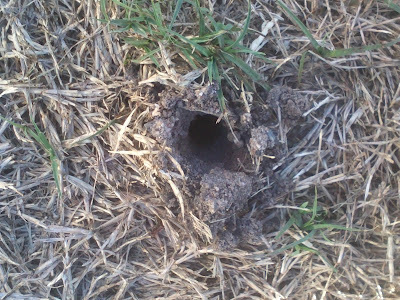 Do you have fresh conical shaped holes with little piles of dirt either in your lawn or garden in the morning? You, my friends have most probably got bandicoot(s) visiting overnight. The bandicoot has a long tail and long nose and prefers to hang out at night-time similarly to a rat but that is where their similarities end. Bandicoots eat spiders, cockroaches, and a variety of other insects, snails and most importantly their favourite food - the black beetle and beetle larva known as curl grubs. 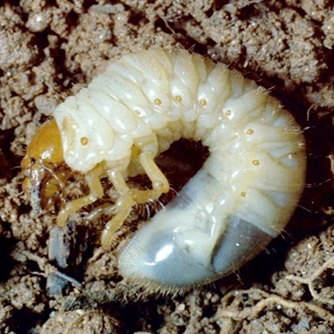 These grubs feed on the root systems of your lawn causing dieback or brown patches. Bandicoots are effectively also aerating your lawn so that it will grow with renewed vigour during spring. They cause no long-term damage and are beneficial to lawns and gardens. Once their food source has gone, so do they - move on from your yard. What perhaps is less attractive is, they can dig up seedlings in the vegetable patch. If you are living in a bandicoot area perhaps some mesh to protect your precious seedlings might be the way to go. These marsupials breed year-round but have a breeding peak from winter to summer, so look out for them now as they will be more active and may have babies with them. Bandicoots generally live for 2-4 years in the wild. They are territorial and usually solitary. The female stays in a relatively small area to forage and mate, but males have a bigger territory and mark and defend their territory by fighting off other males. They do this by standing on their back legs and clawing at each other's shoulders and backs, often leaving scars. Bandicoots are multi-oestrus, meaning they breed several times during the year. Females can give birth to as many as five babies, but usually only one or two survive. These babies remain in her pouch for about three months until they're old enough to fend for themselves. Their gestation period is very short, about 11 days (the shortest of any marsupial). The young are born very tiny and under-developed. They travel through a cord attached to their mother's womb to reach the pouch and here they drink milk from the mother's teats and grow until they are large enough to leave the pouch. Bandicoots are usually solitary animals however during breeding times, your backyard can become a temporary boxing ring for their territorial scuffles. Like wombats, bandicoots have backward-facing pouches so when mum is digging around, her pouch won't fill up with soil. Your best bet to observe them is by torchlight either at night or in the early morning when they will often still be out and about foraging for food. During the day bandicoots will nest in shallow holes in the ground, lined with leaf litter and built under dense vegetation or debris, hiding them from predators and protecting them from rain and sun. Northern brown bandicoot (isoodon macrourus) is around 30-47cm in size and weighs up to 2.1kg. It has small, rounded ears, an elongated snout, and a speckled brown-black coat with a pale to white underbelly.